Because of the extra physiological and physical demands on the body, fatigue is common in pregnancy, especially in the first and second trimesters. Boost your energy during pregnancy by paying attention to your body's additional nutrientional and energy needs and take time to rest and relax. Your main source of energy comes from what you eat. 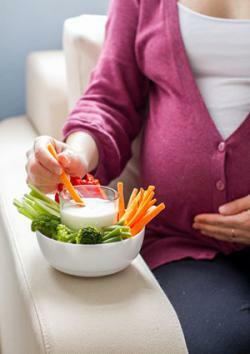 Boost and maintain your energy level throughout your pregnancy by eating a balanced diet every day. According to the Journal of Clinical Nutrition, you need extra "dietary energy" to support your higher metabolism and increased energy stores. Include healthy fats as an additional source of energy and nutrients, such as soybean and flaxseed oils and omega-3 fatty acids. In addition, eat enough calories to meet normal weight gain recommendations so you don't deplete your energy stores. Eat six small meals rather than three large ones. Include a protein with your carbs at each meal for slower absorption of sugar from your gut to prevent blood sugar highs and lows. Avoid simple sugars such as candy, sweetened drinks, and soda, which might give you an initial energy boost but a low energy crash later. Drinking enough fluids to keep hydrated can help you feel less tired during pregnancy. Dehydration can lead to low blood pressure and make you feel light-headed, listless and fatigued. Drink at least eight glasses of water or unsweetened drinks each day. You need more fluids to meet the increased metabolism and blood volume that occurs with pregnancy and to maintain your blood pressure. If your urine is clear, you are likely drinking enough. Although you might not feel like moving, according to the Mayo Clinic, regular exercise can boost and help maintain your energy level during pregnancy. Physical activity increases blood flow and oxygen to your brain and muscles and helps you feel more energetic. Through its effect on your endorphins, exercise will also improve your sense of well-being, which will have a positive effect on your energy level. 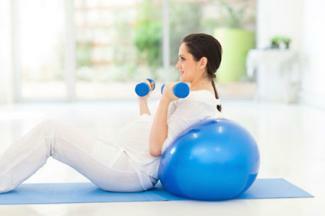 Be sure to check with your doctor for his recommendations on exercise during pregnancy. Adequate sleep and rest will help your body recuperate and boost your energy each day. Try to get at least eight to nine hours of sleep. Lack of sleep or poor sleep quality can drain you of energy, and your fatigue can worsen with each day you don't get enough sleep. As your belly grows in the second and third trimester, a pregnancy pillow can add comfort and support so you can get a better quality sleep. In addition, rest or take a nap during the day if you feel you need to recuperate your energy level. Physical and mental stress from the demands of pregnancy and your responsibilities can drain you of energy. Take a mental break, relax, and reduce your stress if you are feeing tired and need an energy boost. A mental boost will give you a physical energy boost. Relaxation techniques such as meditation, passive muscle relaxation, or stretching exercises (including yoga) for at least 15 minutes a day can reduce stress, improve your well-being, and help you recoup your energy. Make any changes that you can if you find fatigue prevents you from maintaining your usual schedule and tasks, especially during the third trimester. This may include taking an energy break from housework and asking others for help when you need a break. Iron deficiency anemia: The most common cause of anemia in pregnancy, iron deficiency can make you feel week and tired because of its effect on red blood cell production, according to the Mayo Clinic. Vitamin B deficiency: According to Harvard Medical School, the B vitamins help to convert food into energy and help to make red blood cells. Vitamin B 12 deficiency, for example, can cause anemia and low energy in pregnancy and is more common if you are on a vegetarian diet. Hypothyroidism: Low levels of thyroid hormone cause hypothyroidism, one of the thyroid diseases that may go undiagnosed in pregnancy. Be sure that you are screened for anemia and thyroid disease at your first prenatal visit. Take your prescribed iron and vitamins or other treatment as recommended. Consult with your doctor or midwife for further evaluation if you continue to have low energy despite the recommended energy-boosting remedies, or after treatment of vitamin or hormonal deficiencies.